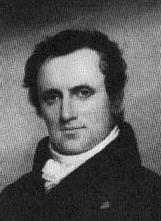 James Fenimore Cooper was born on September 15, 1789 in Burlington, New Jersey, the twelfth of thirteen children. In 1790, the family moved to Lake Otsego, in upstate New York. Early experiences in a frontier town gave Cooper the background for The Pioneers (1823), among other frontier novels. After being expelled from Yale College, in 1806 he tried to run away to sea, but his father intervened and got him a commission in the United States Navy. He sailed twice to England and served at a frontier outpost on Lake Ontario before being assigned to recruit sailors in New York City, where he met his future wife. After the deaths of his father and older brothers left him heavily in debt, Cooper cast about for a reliable source of income, and his career as a writer began. His first tale, Precaution, was published in 1820; the work and its reception were agreeable enough to encourage Cooper to continue, and his next novel, The Spy: A Tale of the Neutral Ground (1821) established him as an exciting new presence on the American literary scene. More works quickly followed --The Pilot (1824), Lionel Lincoln (1825), The Last of the Mohicans (1826), and The Prairie (1827). By the time of his death, Cooper had developed an international reputation as America's "national novelist" and was probably more successful in the overseas market. But both at home and abroad Cooper was best known for his five Leatherstocking novels (The Pioneers, 1823, The Last of the Mohicans, 1826, The Prairie, 1827, The Pathfinder, 1840, and The Deerslayer, 1841). All his novels utilized historical themes and helped to form the romantic popular sense of American history in the nineteenth century. Literally the story of the birth, life, and death of a personified handkerchief. The story of a young girl whose imagination gets the best of her. Story of Hawkeye, adopted son of Chingachgook. Tale of frontier life involving Judge Marmaduke Temple, Natty Bumppo, and chief Chingachcook. Details the habitation of the Great West and what it meant for the Native Americans and the land, itself.